Join us in a 50 mile bike ride to continue raising awareness for Federal Dream Act, California Dream Act (institutional financial aid) and getting drivers licences for all California residents, as well as bringing attention to the rights of all bicyclist in the city of L.A and Orange County. 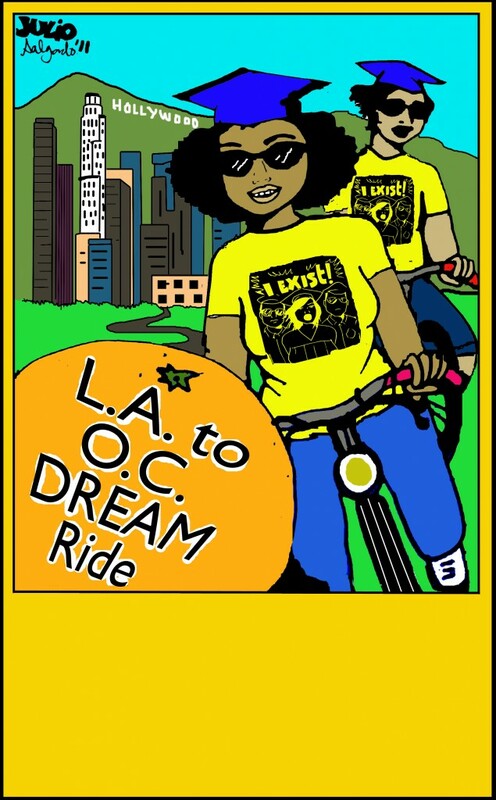 Spokes & Words, The Orange County Dream Team and Dream Team Los Angeles are working together with City of Lights and the Bici Digna program in organizing and funding this event to bring together all these great orgs that fight for social justice for for all. Route: Approx 50 miles via streets of L.A., San Gabriel River Bike Path and streets of Santa Ana. Housing: Sleeping over at Centro Cultural de Mexico. Individuals are responsible for bringing their own sleeping bag, pillows, blankets, toiletries, change of clothes etc. and transportation back to L.A. A truck will carry participant’s belongings, sleeping bags etc. to Santa Ana and back to CDP after ride is over. Food: Lunch, dinner and snacks will be provided for all participants accounted for, for the event. Bike Safety Work Shops: All participants of event will be required to attend at least one workshop on safety, rules of the road and ridding in a group. No exceptions. First workshop will be at CDP on Jan 23rd from 1 to 4 p.m. Second will be at Centro Cultural in Santa Ana on Jan 30th from 1 to 4 p.m. and the final workshop will be at CDP on Feb. 5th from 1 to 4 p.m. Riders needing help with their bikes will be encouraged to bring them to the workshop for maintenance and bike tune up. Workshops will be coordinated by City of Lights. Sponsorship opportunities are available for anyone that wants to donate food, supplies or sponsor riders for the event as well. Over the summer I joined up with Dream Team Los Angeles to help with the campaign that’s behind the DREAM Act. The team is a coalition of college support groups, organizations and individual community members combining their efforts to help pass the DREAM Act. With soo many different orgs and individuals out there doing their thing, the team unites all of those resources and people power to get work done. Whether it’s holding/participating in workshops to help people know what the DREAM Act is, how it helps them and how undocumented kids can still get a higher education at the college/university level. On June 23 we had a DREAM Graduation to raise some hell and get major media to take notice and it worked. as we continue to make legislative visits to congressional reps and continue to keep the DREAM Act in the publics conscience, letting people know about the team and what we do is also an integral part of what we do. I know because I’m the co-chair of out reach and recruitment. 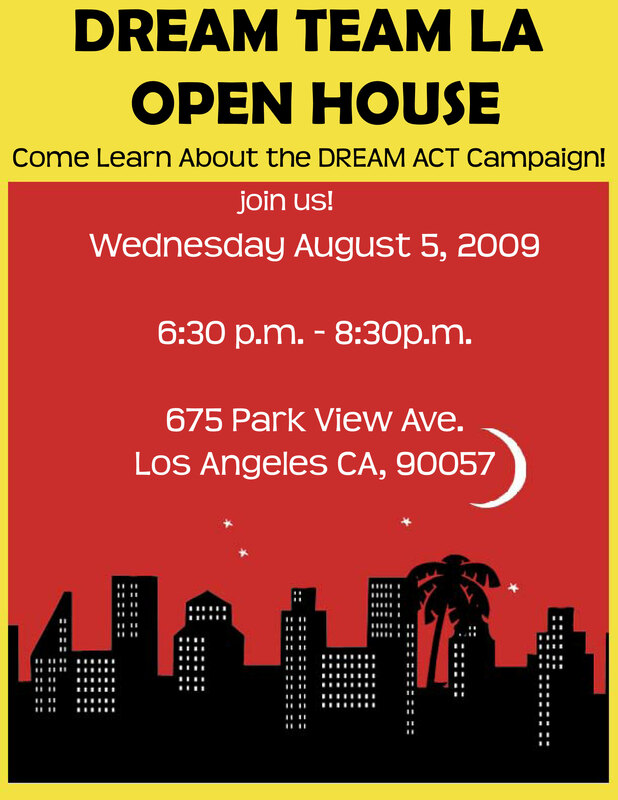 So with that being said I urge anyone who is interested in learning and/or helping with the DREAM Act campaign to come to the open house and find out what the team is about and meet great like minded people. If anyone wants anymore info contact the team at dreamteamlosangeles@gmail.com. I have been helping put this together the last few weeks and on behalf of Dream Team Los Angeles, I want to invite everyone reading this post to come to city hall on Tuesday and be witness to an amazing event. From the press release. Urge President Obama and Congress to Pass DREAM Act this year, 2009! WHAT: DREAM Graduation Ceremony held in Los Angeles, CA in solidarity with the United We Dream Coalition’s National Day of Action in Washington D.C., in support of the DREAM (Development, Relief, and Education for Alien Minors) Act. The DREAM Act is a bi-partisan legislation that if passed, would provide undocumented college students a path to legalize their status after meeting strict requirements. These requirements include that the student must have entered the country before the age of 16, graduate high school or obtain a GED, have good moral character (no criminal record), and have at least five years of continuous presence in the US. The students will then have six years within which they must obtain a two-year college degree or voluntarily complete two-years of military service, in order to have the chance to adjust their conditional permanent residency to U.S. citizenship. 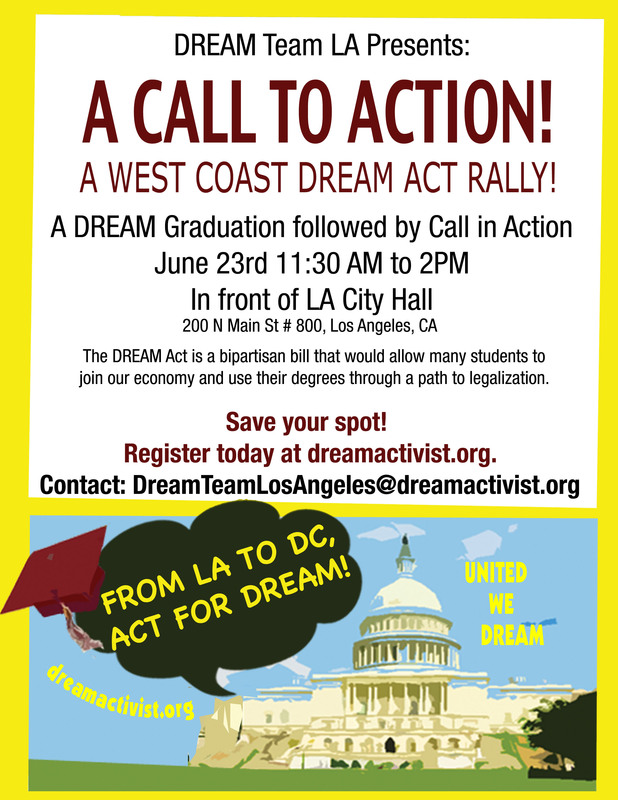 WHO: UCLA student speakers will discuss the importance of the DREAM Act. Undocumented students will provide testimonials of their journey as undocumented. WHY: Highlighting the achievements of our nation’s undocumented youth and the vast support for passage of the Development, Relief, and Education for Alien Minors (DREAM) Act.